A court in the Philippines charged six Chinese fishermen with poaching endangered sea turtles in proceedings Monday aimed at protecting threatened wildlife along the country's coastline. 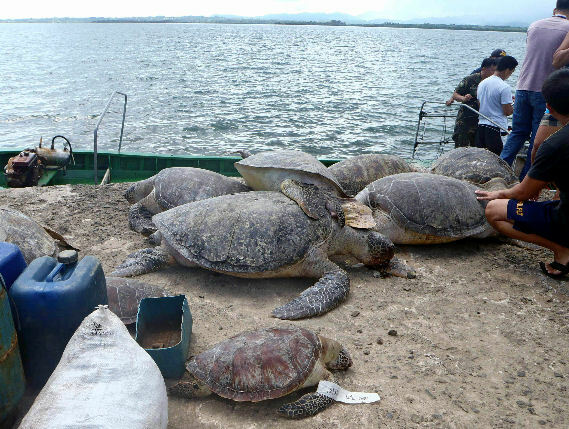 Authorities discovered a batch of giant green turtles after intercepting the fishermen's speedboat in waters off the western province of Palawan on Friday, said military spokesman Maj. Niel Estrella. A joint team from the Philippine navy, coast guard and the Environment Department made the seizure. The boat was likely attached to a mother ship that escaped after the fishermen were detained, Estrella said. Nine of the turtles were already dead, but three were released alive into the waters after being tagged, Glenda Cadigal, a wildlife specialist at the Palawan Council, told The Associated Press. The sea turtles, also known as Chelonia mydas, are often caught for food and for use in traditional medicine. They can grow as long as 5 feet (150 centimeters) and weigh as much as 290 pounds (130 kilograms). They are endangered because of overharvesting of both eggs and adults. On Monday, authorities filed criminal charges under the Philippines' Wildlife Act and Fisheries Code at the Palawan Regional Trial Court in the capital Puerto Princessa, said Adelina Villena, chief lawyer for the government's Palawan Council for Sustainable Development. If found guilty on all charges, the fishermen would face up to 24 years in prison. They were not requested to enter a plea Monday and a date for their arraignment was not immediately set, Villena said. In Beijing, Foreign Ministry spokesman Hong Lei said China was "paying attention to the incident" and asked the Philippines to ensure the safety and legal rights of the fishermen. "The Chinese Embassy in the Philippines has sent staff to visit the detained fishermen," Hong said. 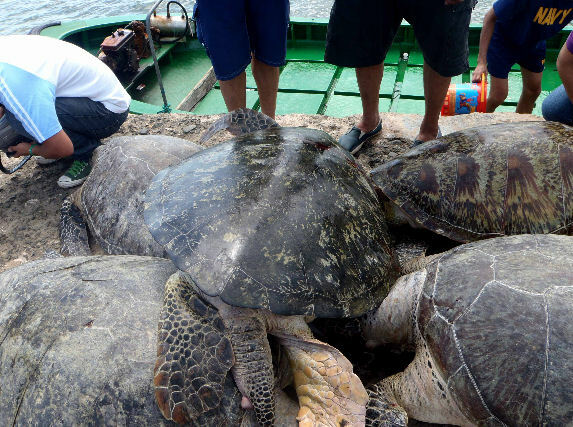 Last year, six Chinese fishermen also on a speedboat were arrested near the same area with more than 50 turtles, many of them already butchered and one bearing a monitoring tag of the University of the Philippines Marine Science Institute, said Cadrigal, the wildlife specialist. The trial of those fisherman is still continuing. 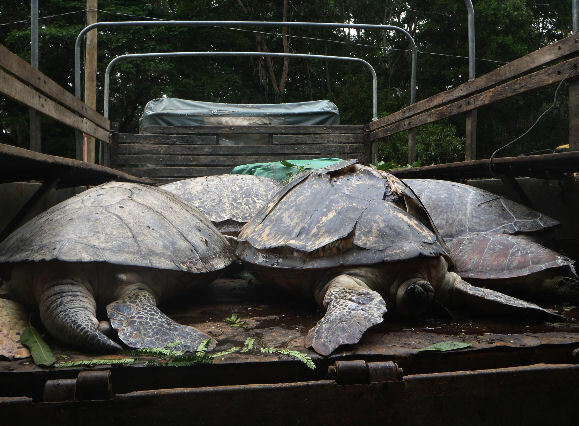 "These kind of practices endanger the lives of other creatures in the sea because marine turtles have their function in the balance of the ecosystem," Cadigal said. Sea turtles feed on sea grass, which keeps the blades short and promotes their growth across the sea bed, and also provide sand beaches with nutrients, partly because of the eggs they lay that remain unhatched. Palawan, about 510 miles (820 kilometers) southwest of Manila, is the nearest Philippine province to the disputed Spratly Islands in the South China Sea, which are claimed by China, the Philippines, Taiwan, Malaysia, Vietnam and Brunei. Relations between the Philippines and China have recently soured after Manila accused Beijing of interfering with its oil exploration activities in the sea China claims in its entirety.